From New York Times bestselling authors Mickey Spillane and Max Allan Collins--the legend of Caleb York continues as the renowned gunslinger fights to bring justice to the blood-soaked streets of Trinidad, New Mexico. Caleb York has made up his mind and packed his bags. He'll be on the next stage, bound for San Diego and a new life as a Pinkerton man. But before Caleb can say a proper goodbye to his sweetheart, Willa, a peaceful morning erupts into blazing gunfire. Someone has to bring law and order to the wild little town of Trinidad, even as a band of outlaw brothers rides the vengeance trail and a new cattle baron sets his sights on more land. . .and on Willa, too. Looks like Caleb will be staying on for a while. With his Colt loaded for justice, and a sheriff's badge on his chest, Caleb York emerges as a classic Western hero who knows just how to stand up to the deadliest of enemies--and win. Mickey Spillane is the legendary crime writer credited with igniting the explosion of paperback publishing after World War II through the unprecedented success of his Mike Hammer novels. Spillane's novels sold tens of millions of copies. I, The Jury went through more than 60 paperback printings in 1947 alone. In 1995, he was named a Grand Master by the Mystery Writers of America. 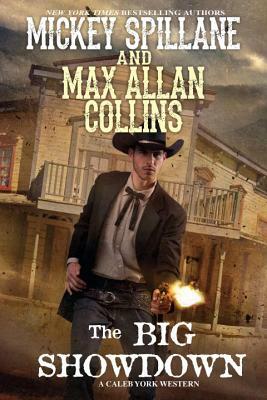 Before his death at the age of 88 in 2006, Spillane chose long-time friend Max Allan Collins to complete his unfinished works and act as his literary executor. Max Allan Collins is the New York Times bestselling, award-winning author of Road to Perdition, the graphic novel that inspired the Oscar-winning movie starring Paul Newman and Tom Hanks, and of the Shamus-winning Nathan Heller series of historical hardboiled mysteries. With his wife Barbara, he writes the acclaimed Trash 'n' Treasures mysteries under the byline Barbara Allan. Also a filmmaker, Collins created the documentary Mike Hammer's Mickey Spillane. He lives in Iowa. Visit him at www.maxallancollins.com.